I know that I have likely irked some of you already by writing a Christmas-themed column before we have even gotten to Thanksgiving, but I can at least offer the caveat that it will likely not be near as onerous as the fact that the latest crop of political parasites (with all due respect to Ron Paul) have already ramped up their bids to be placed in positions of power over us roughly about a year from now. 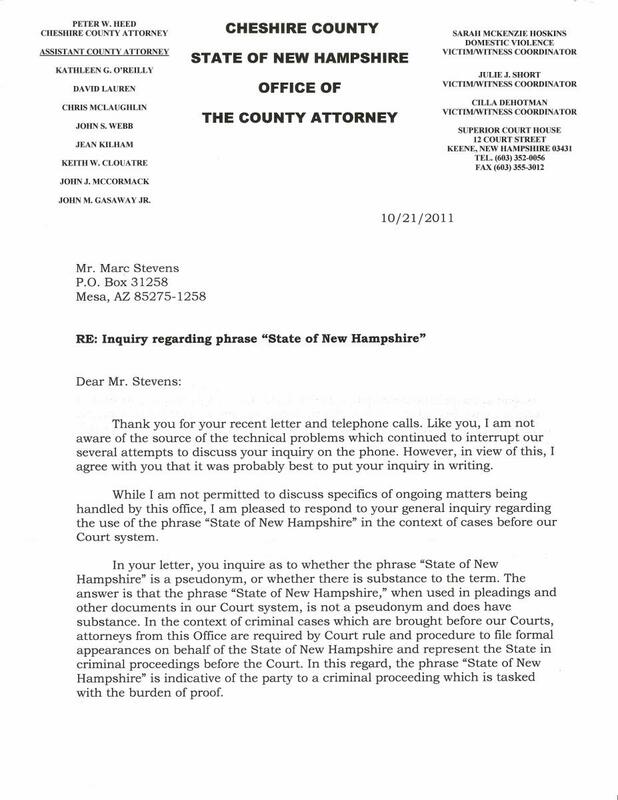 In point of fact, I’d like to repair back to the November 5th broadcast of Marc Stevens’s “The No-State Project,” wherein Marc and his co-host JT discussed a recent response letter received from New Hampshire Cheshire County Attorney Peter Heed. 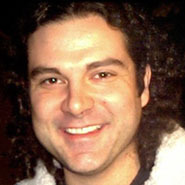 Marc had evidently sent Heed a letter asking for a definition of the term, “State of New Hampshire” as it applies to all legal matters in government courts. In his response (really a non-response, as you can see in the accompanying letter), Heed concocted some absolutely classic lawyerese gobbledegook: Note how Heed maintains that he is “required to file formal appearances” on behalf of the “State of New Hampshire,” and to “represent the State.” This automatically raises the question, of course, that if the “State of New Hampshire” has actual substance – as Heed openly claims – then why must he act on he, she, or its behalf? Why must Heed “represent the State” if “the State” is an actual entity? 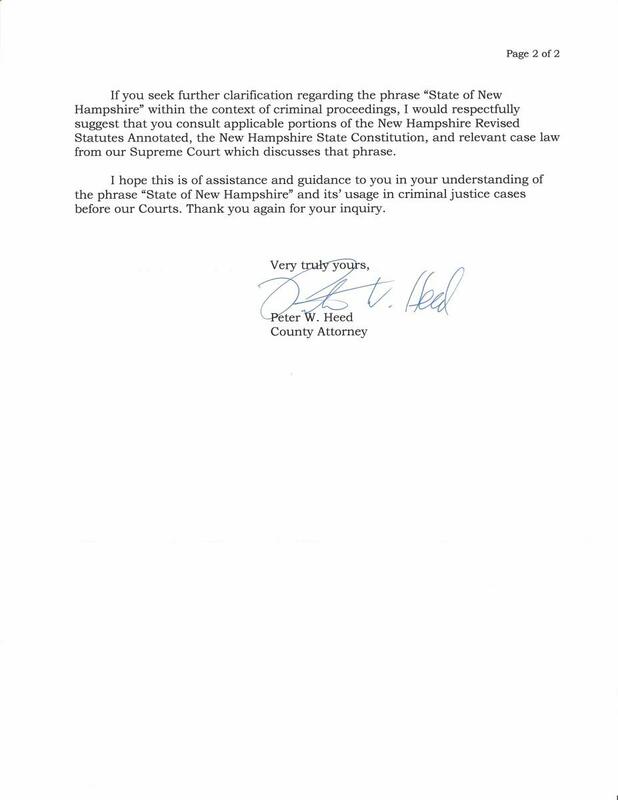 This chicanery is further exposed by Heed’s further admonition on page 2 of his letter wherein he directs any “further clarification” to the New Hampshire Revised Statutes Annotated, the New Hampshire Constitution, and “relevant case law from our Supreme Court.” It was this parting abdication on the part of Peter Heed to provide anything of substance that prompted Marc Stevens, during his broadcast, to draw an analogy: Suppose Marc were asking if there were really a Santa Claus? The equivalent of Heed’s final advice would’ve been to say, “Just read ‘The Night Before Christmas’ and that contains everything you need to know right there.” My own analogous response might be something like, “Well, millions of children all over the world look forward to Santa Claus’s annual visit where he delivers all kinds of toys and joyous surprises to youngsters from his home at the North Pole....” You get the idea. Neither response is in any way whatsoever in address to the actual question: Is there a Santa Claus? Perhaps I’m about to get a bit grim. A bit Grinch, even. But it dawned on me not long after Marc’s broadcast that perhaps we are dealing with a problem even deeper and more firmly entrenched than we realize. “VIRGINIA, your little friends are wrong. They have been affected by the skepticism of a skeptical age. They do not believe except [what] they see. They think that nothing can be which is not comprehensible by their little minds. All minds, Virginia, whether they be men's or children's, are little. In this great universe of ours man is a mere insect, an ant, in his intellect, as compared with the boundless world about him, as measured by the intelligence capable of grasping the whole of truth and knowledge. “Yes, VIRGINIA, there is a Santa Claus. He exists as certainly as love and generosity and devotion exist, and you know that they abound and give to your life its highest beauty and joy. Alas! how dreary would be the world if there were no Santa Claus. It would be as dreary as if there were no VIRGINIAS. There would be no childlike faith then, no poetry, no romance to make tolerable this existence. We should have no enjoyment, except in sense and sight. The eternal light with which childhood fills the world would be extinguished. “Not believe in Santa Claus! You might as well not believe in fairies! You might get your papa to hire men to watch in all the chimneys on Christmas Eve to catch Santa Claus, but even if they did not see Santa Claus coming down, what would that prove? Nobody sees Santa Claus, but that is no sign that there is no Santa Claus. The most real things in the world are those that neither children nor men can see. Did you ever see fairies dancing on the lawn? Of course not, but that's no proof that they are not there. Nobody can conceive or imagine all the wonders there are unseen and unseeable in the world. “You may tear apart the baby's rattle and see what makes the noise inside, but there is a veil covering the unseen world which not the strongest man, nor even the united strength of all the strongest men that ever lived, could tear apart. Only faith, fancy, poetry, love, romance, can push aside that curtain and view and picture the supernal beauty and glory beyond. Is it all real? Ah, VIRGINIA, in all this world there is nothing else real and abiding. No doubt, Mr. Church penned this piece some eleven-and-a-half decades ago as little more than an amusement – a note of friendly encouragement to an inquisitive little girl as summer was just turning to autumn in that year of 1897. But I can’t help thinking that there is also something prophetic here, something darker and far less amusing. It is indicative of an entire pattern of thought. It is as if willful blindness is hailed as a kind of virtue. As if deceit, both from without, and self-deception, are to be regarded as virtues rather than serious impediments to rational judgement. As if living in a chimerical fantasy land is preferable to facing reality. If my suspicions are in any way correct, Peter Heed, those of his bureaucratic ilk, and the system they so avidly support and make livings from, are directly indicative of this. I feel no further need for vindication. So let me here, in 2011, proclaim No, Society, There Is No Santa Claus! "...when used in pleadings and other documents in our Court system..." is the qualifier. Is Elmer Fudd a pseudonym or does 'he' have substance? Elmer Fudd, when used in a Bugs Bunny cartoon, is not a pseudonym and does have substance. Like the State of New Hampshire, Elmer Fudd is an artificial person, which, in the case of State of New Hampshire, is a person, "created and devised by human laws for the purposes of society and government, as distinguished from natural persons", (who are created by nature and do have substance, [as this word is commonly understood]). Suverans2, "society" is indeed a pseudonym (reification, I think, might be a better word). You exist -- I exist -- those we love exist. "...as if willful blindness is hailed as a kind of virtue. As if deceit, both from without, and self-deception, are to be regarded as virtues rather than serious impediments to rational judgement..."
Lately I've felt compelled to default to Delmar England's rather difficult to read but salient treatise on reification and its effect upon those of us attempting to lead a free and anarchic lifestyle. As a Sovereign State I can only look upon the Peter Heeds of the world, as well as the Blacks (who presumed to define "legality"), as members of a criminal gang -- far more dangerous than non-government criminals. Non-government criminals do not generally attempt to lend legitimacy to their actions. They may make excuses for their behaviors, but they don't believe -- nor do they try to convince me -- that what they do is legal. They seek my resources -- not my support. Non-government gangsters expect no pledges of allegiance. The danger of government criminals is in their sincerity (to wit: Ron Paul). You've discovered that reliance for a definition upon an individual so steeped in the "legitimacy of state" as is Heed is futile. I agree, Sam, "society" is most certainly "reified", i.e. (something abstract) regarded as a material or concrete thing, by the most people.